White ascot fastens around neck w/ self-fabric ties. What’s this? What’s this!? In all the world, there is no greater lover of the thinning of the veil, the mysterious happenings, and spooky tidings of All Hallow’s Eve as the Pumpkin King, Jack Skellington. As the patron saint of Halloween, the living skeleton can remove parts of his very body, usually to only comedic effect rather than harm. While lacking the more conventional magic of Santa, locked away in his own wintry holiday, the oddly friendly skeleton’s powers are an intriguing set of spooky tricks that ensure each year the world’s population find joy in their terror. Of course, lacking elvish magic isn’t anything to keep the Pumpkin King down. If that smiling skull is ever looking down, he just takes a quick jaunt into any of the other magical holiday doors or, better, slips into the living world to stir up a few screams. And you thought that clowns were the thing to be spooked by! After doing a deal of research into how to keep his powers working all year round, Jack finally has the means to break through that barrier and allow the spirits to gallivant with the rest of us at their whim. 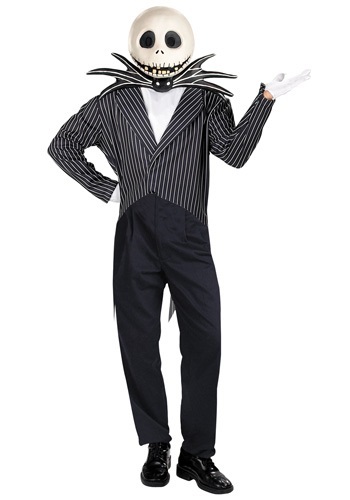 All we need is you to lead the charge in this Adult Jack Skellington costume. This black and white pinstripe tail coat jacket had exaggerated, wide lapels and a bat-shaped vinyl bow tie to make the look that perfect blend of high society and horrifically hysterical. The white ascot fastens easily with fabric ties. Then, get ready to smile wide when you slip on this molded latex head mask with black mesh-covered eyes. Add a few perfect accessories like a skull cane or long black slacks or perhaps even a hovering spectral hound companion and the season will truly be yours!